Seven years after Gomorra, and three years after Reality, winners of the Grand Prix du Jury in 2008 and in 2012, the director brings us Il Racconto dei Racconti (Tale of Tales), inspired by the Pentameron, a collection of 17th century fables inhabited by sea monsters, giants bats and fleas, marvelous castles and mazes. Anything but bland, the tales are often savagely realistic and sprinkled with a fair dose of cruelty. Three fables, three kingdoms and three interlaced tales. From the 50 stories in Giambattista Basile's The Tale of Tales or Entertainment for Little Ones (Lo cunto de li cunti overo Lo trattenemiento de peccerille in old Neapolitan), Matteo Garrone has adapted three. The story concerns three neighboring kingdoms ruled respectively by a lewd and promiscuous king, a sovereign whose attention is taken by a strange animal and a queen obsessed by her desire to have a child. "We tried to preserve the evocative power of the Cunto, which has fed the universal imagination down the centuries, influencing writers like Perrault and the Grimm brothers". To translate this imaginative strength, director could envisage no other form of expression than the language of cinema, "a language that could have its own specific richness". While clearly not intended for children, these movie tales, set as they are against a background of fabulous decors peopled with witches, fairies and hideous monsters, address contemporary subjects such as the conflict of generations, procreation and the quest for eternal beauty. 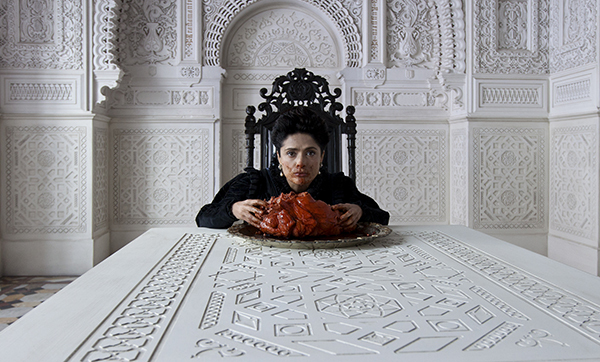 With an exceptional international cast including Salma Hayek, Vincent Cassel, and Toby Jones, this monument to the imagination slips easily from the baroque to the gothic and even into horror. Without ever forgetting the touch of humor.